In 1991, Automotive Lighting was the first to introduce Xenon technology on the market. 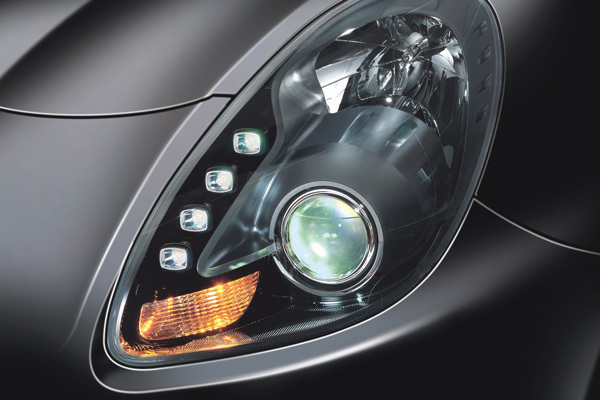 Compared to conventional halogen headlamps, the Xenon system can provide 200% more light. This means that both the road in front of the vehicle and the roadside are more effectively illuminated. The light on the road is similar to daytime light, which means that it adapts to the natural condition of the human eye, as a result driving becomes safer and more relaxing. Moreover, Xenon lamps need approximately one third less energy compared to halogen lamps, and they last almost as long as the vehicle. Xenon technology is used for low and high beam applications. They both use an electromagnetic actuator to move a device and switch from low to high beam (projection system principle). The switch from low to high beam can also be activated by a small movement of the discharge lamp in the reflector (reflexion system principle). Moreover, Xenon headlamps are fitted with an automatic levelling system as standard equipment that adjusts the headlamps according to the different load conditions, in order to avoid dazzling oncoming motorists. The law requires that Xenon headlamps be equipped with cleaning systems to ensure clean lenses and even light distribution.